For years, I thought maple syrup was produced by Aunt Jemima. I thought she herself would tap all the Sugar Maple trees in her backyard and produce the sticky goo that flows out of the bottle (the one that is shaped like her). I secretly wished Aunt Jemima was my aunt, so I could never run out of the stuff that I (still) love on my waffles. And over the years, I’ve come to learn that real maple syrup is actually a lot thinner than the store produced brands, and that Aunt Jemima is a brand based on a fictional character, now owned by Quaker Oats. 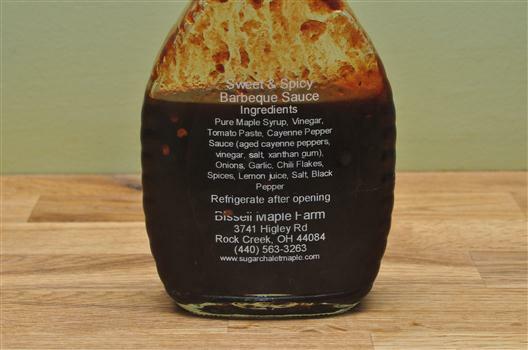 You don’t see a lot of maple syrup flavored BBQ sauces, and fewer are sweetened based on Pure Maple Syrup alone – mostly due to the expense of the maple syrup. This sauce shows us what maple BBQ sauce should be – it comes straight from the Bissell Maple farm in Rock Creek Ohio, and with it comes the pure thinness of maple syrup and the pure flavor – a sweet yet more subtle flavor compared to what a big brand might produce artificially. I really liked it on my BBQ chicken. 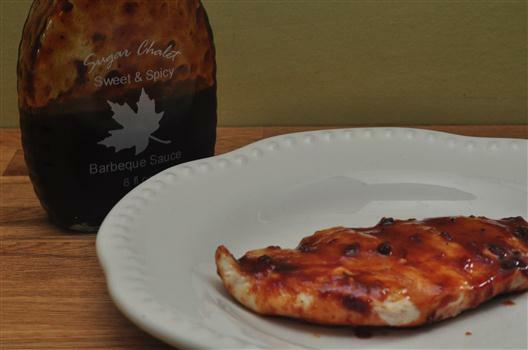 The Sugar Chalet Sweet and Spicy Barbecue Sauce delivers a great tasting, pure maple BBQ sauce that is sourced from real trees and not chemically produced in a lab. In order to get to the next level, I wanted a little more heat and a little more thickness. By the way back up 660+ now, out of control. Kyle, you are an inspiration to us all. Those who love BBQ sauce anyway.